Image: “Paid Off” with Michael Torpey. There's a long history of TV programs that exploit the personal struggles of individuals for ratings. Now there's a new game show that tackles the student loan crisis. Like its predecessors in this genre, it's bad. In the 50s, Queen for a Day featured three women, different each episode, telling their tales of woe in front of a studio audience. Contestants included war widows, mothers with sick children, women who had lost everything in fires… real and tragic stuff. Each woman would request something that would make her life easier. Whoever was crowned Queen for that episode would receive their request, along with a bevy of other prizes donated by companies for “promotional consideration.” Oh, and a year’s worth of Chesterfields. How was the winner/Queen chosen? BY APPLAUSE METER. Did you just cringe a little? Me, too. I mean, imagine having a kid with brain damage and receiving fewer applause than the woman whose brother got shot during some shady dealings. Sorry about your kid, lady. But we’re just not feeling it. A little pitchy, dawg. 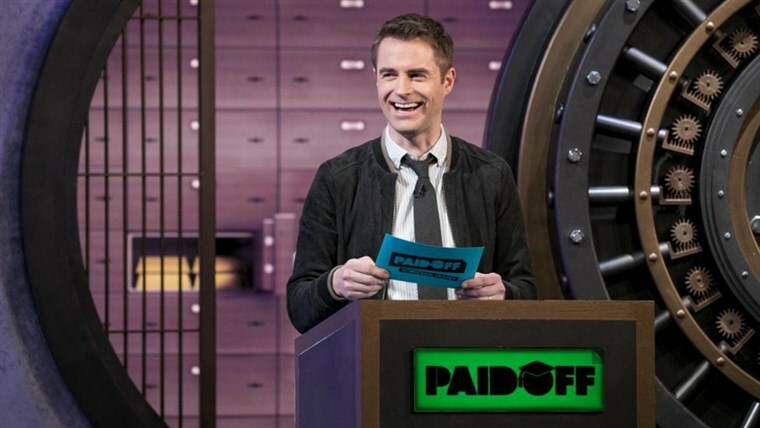 60 years later, the nation’s student debt crisis is fodder for a new game show on TruTV called Paid Off. 44 million Americans owe almost one and a half TRILLION dollars in student debt. Many student loans are structured so that any money paid goes towards the daily compounded interest instead of the balance, creating an inescapable hamster wheel of payments and misery. In other words, it’s perfect game show material! The game itself is your standard trivia show. Three contestants answer questions and receive money for each one they get correct. The person with the most amount of money goes to the final round where they receive a percentage of their debt paid off for every correct answer. Get eight questions right and their debt is paid off completely. Enjoy the sneak peek of our dystopian future. May the odds be ever in our favor.